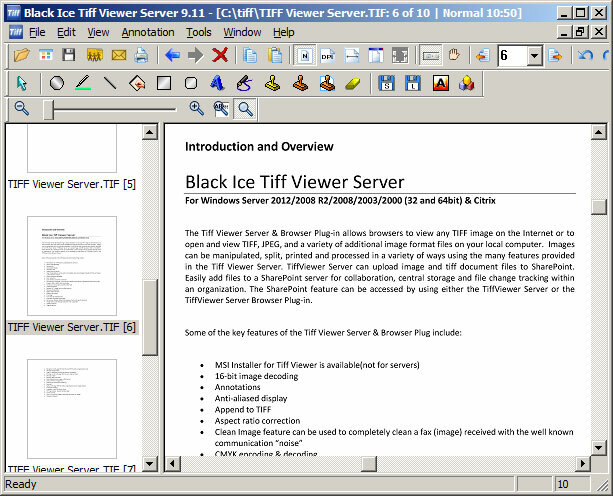 The TIFF Viewer Server includes both a browser plug-in and a standalone TIFF/Image Viewer. The TIFF Viewer Server is ideal for viewing, editing and printing TIFF and a variety of additional image types. The TIFF Viewer is commonly used for editing and cleaning faxes, browsing the USPTO web site, scanning documents for electronic archival, processing and printing digital photos and much more.